Taxpayers over in Canada are being targeted by a large-scale fraud, where threat actors pretend to act on behalf of Canada Revenue Agency. Unsuspecting people have been receiving rogue emails, text messages and phone calls insisting that they pay an inexistent fiscal debt, claim a tax refund or receive INTERAC e-Transfer from CRA by submitting personally identifiable information. The emails are fake tax refund notifications that say the following: “We have received your tax calculation and we have determined that you are eligible to receive a tax refund.” While the wording of this catchy message may vary, the idea is the same across all the cases – the targeted people are duped into believing that they can claim a tax refund of several hundred Canadian Dollars. Most of these emails contain Canada Revenue Agency logo and contact details in order to appear trustworthy and been received from reliable addresses like notif482@gsr.trustwave.com. This is a commonplace phishing tactic, where scammers leverage the best practices of social engineering to persuade users into thinking they are dealing with the genuine organization. Furthermore, the con in question is most likely to be backed by a massive dump of Canadian taxpayers’ email address. 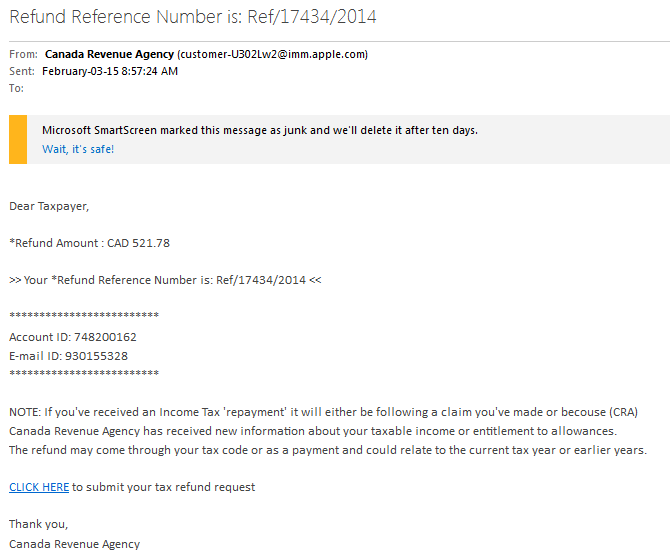 The phony Canada Revenue Agency tax refund emails invariably contain a link to a certain external online resource. These references as masqueraded as hyperlinks to a page where people can purportedly submit their tax refund request. 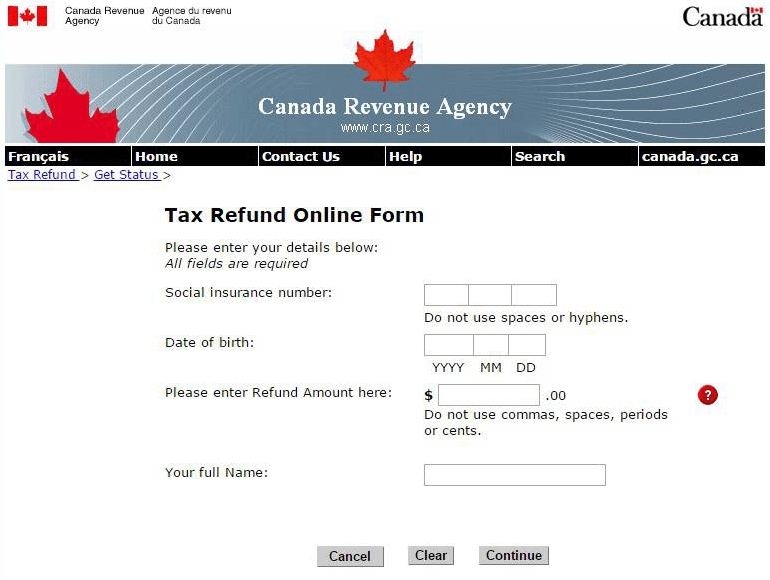 Again, these rogue sites titled “Tax Refund Online Form” stay true to CRA branding. In some cases, even the URL may be correct, which will completely convince most users to trust the service. This is natural, because not everyone knows about such thing as DNS hijacking, a malicious technique where domain names being resolved in the web browser are mapped to the wrong IP address. Sometimes, though, the URLs are apparently incorrect, but people bedazzled by the prospect of getting a pretty penny back from the government simply don’t pay attention to such technicalities. The counterfeit tax refund form pursues one simple goal – to wheedle sensitive information out of victims. Aside from details like the person’s full name, date of birth, address and social insurance number, the page will also ask for their mother’s maiden name and credit card data, including the card type, number, expiration date and the CVV2 verification number. These details can be enough to pilfer money from their bank account. At the end of the day, in pursuit of easy money gullible people can be owned instead of getting the alleged refund. In the event you have clicked any links embedded in Canada Revenue Agency scam email, chances are your computer has been furtively compromised by malicious code, such as a DNS hijacker or a piece of Locky/Zepto ransomware. The extermination of malicious entities accompanying the CRA scam can be efficiently accomplished with reliable security software. Sticking to the automatic cleanup technique ensures that all components of the infection get thoroughly wiped out from your system. 2. The scan will come up with a list of detected items. Click Fix Threats to get probable malware removed from your system.